I know I’ve been posting lots of pictures of the boys together on Facebook, and that it’s probably getting to be pretty boring viewing, BUT… I can’t help it. I love/can’t believe that they’ve gotten to a stage where they can actually interact with each other. Once Emil started walking, I’d look over at our little play area and kind of do a double take; since when do I live in a house with two little boys — not a toddler and a baby? Somehow, that caught me off guard. Now I’m used to it (kind of) and continue to be fascinated by these two little beings as their personalities develop. Here they are today after barnehage. 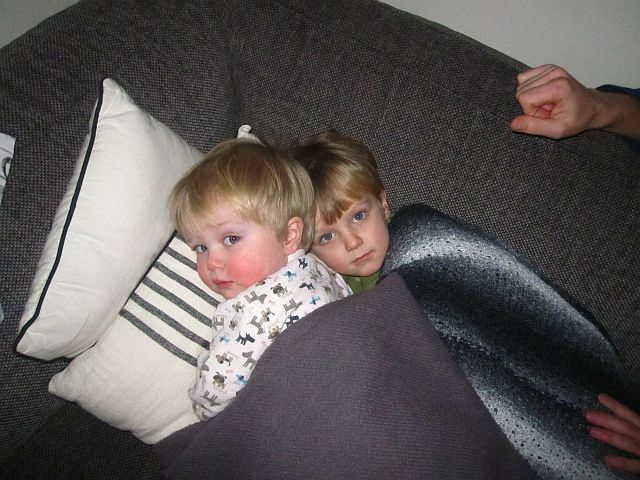 Karel was ”resting” on the couch, and Emil came to join in. Note Emil’s arm around Karel’s neck. Despite being the younger of the two, Emil is starting to treat Karel as a ”kosedyr” (stuffed animal) as opposed to the other way ’round. 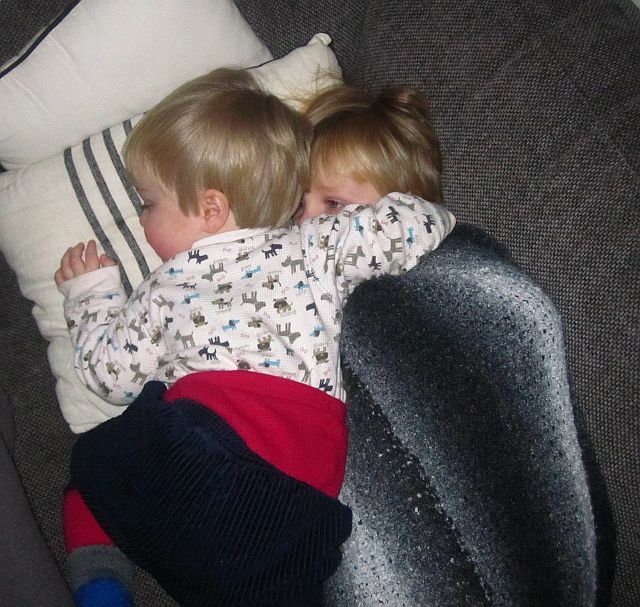 Karel was happy to have the company, and ordered that an extra blanket ”that Emil Birk likes” be brought over. I’m not holding my breath that they’re going to be snuggle-buddies forever, or even for very long. I know how the sibling thing works. Thus this need to document it photographically as it happens. I’m sure there will be other things in store for us to make my heart swell and chest contract the way it does seeing the little people I love most show love to each other…but for now, that pretty much tops it.